Armenia (ar. - Հայաստան, Hayastan) em i kantri long Esia. 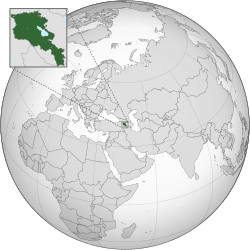 Kantri we i klostu long em i Georgia, Azerbaijan, Iran, na Teki. Kapitol bilong em i Yerevan. President bilong kantri em i Serzh Sargsyan. Praim Minista bilong em i Tigran Sargsyan. ↑ The World Fact Book – Armenia. Central Intelligence Agency. Retrieved on 2010-07-17. ↑ Statistical Service of Armenia. World Economic Outlook Database, October 2009. IMF. Retrieved on 2 September 2010. ↑ News.am. World Economic Outlook Database, October 2009. IMF. Retrieved on 1 January 2011. ↑ 7.0 7.1 7.2 7.3 Armenia. International Monetary Fund. Retrieved on 2010-04-12. This page was last edited on 30 Ogas 2018, at 02:42.